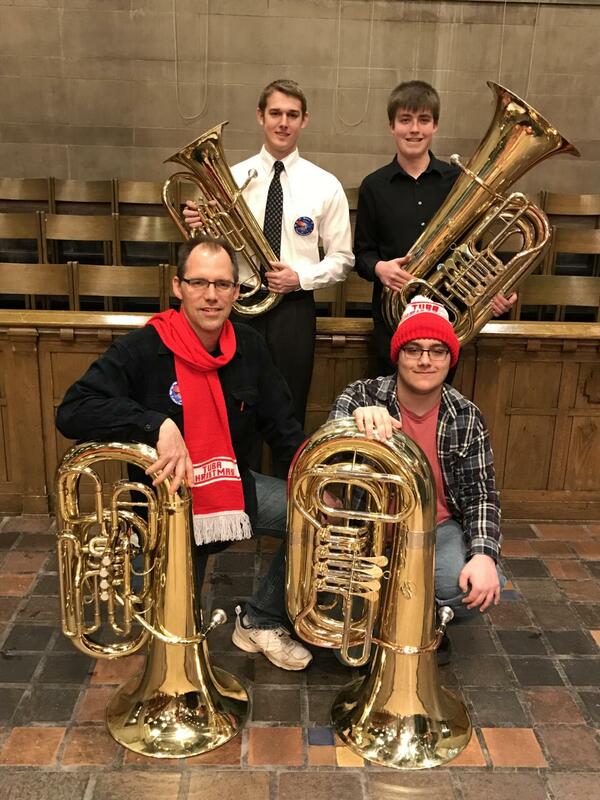 Cannon Falls students and teacher perform unique Christmas music featuring solely tuba and euphomium players. Everyone had noticed when senior Jacob Norton, our most prominent tuba player, was absent from band. The lack of low tones and deep sounds from this instrument left the band feeling empty and without an important component. While tubas may not typically have interestingly complicated parts or the melody, they are key when it comes to harmonizing with the whole band while also keeping a solid tempo and beat. 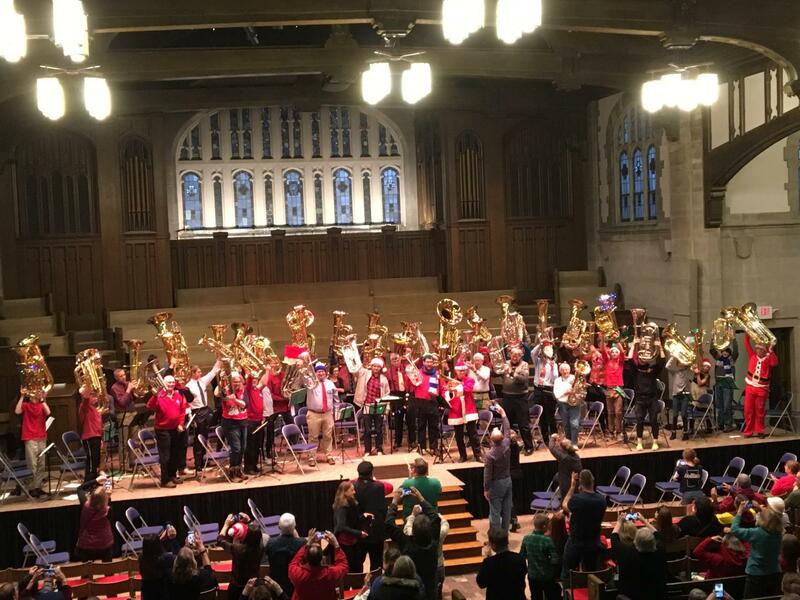 Recently, some have banded together at the annual Tubachristmas event as well as at our own high school to perform familiar christmas songs with low brass instruments. While walking into school the day before Christmas break, there was an unusual sound coming from the atrium. Ryan Schlichting, Jacob Norton, Mitchell McManus, Ian Sawdey, and Mr. Legvold were all performing familiar Christmas tunes such as We Wish You A Merry Christmas as a way to get everyone into the holiday spirit. This does not happen annually which is why it was fun to have these low toned instruments welcoming students into the school on their last day before the holiday break. A chorus of low sounds may have been nice, but there was a different and more full noise coming from the Skinner Chapel at Carleton College in Northfield earlier in the month. 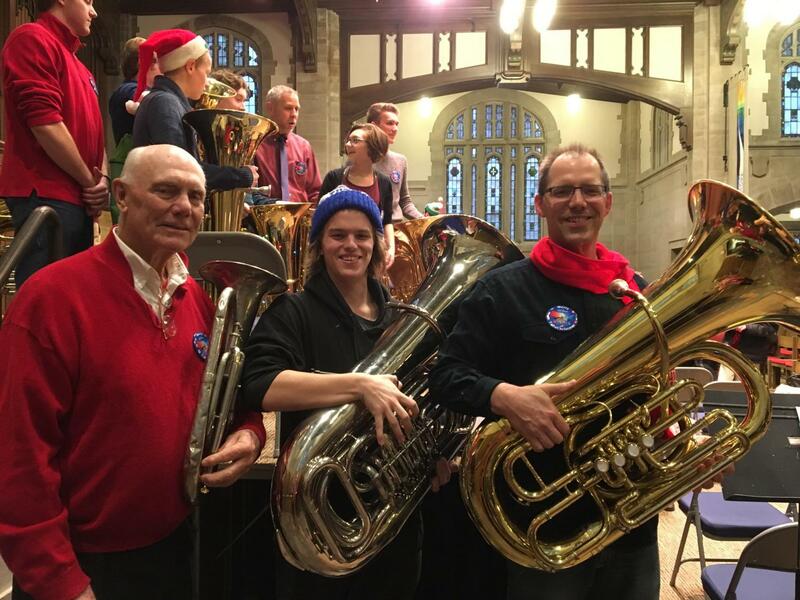 At the annual Tubachristmas event in Northfield, Mr. Legvold and three other students were all a part of the larger band of tuba and euphonium players. Jake Norton, Mitchell McManus, and Tom Sucher all performed in this massive band of rich and deep sounding instruments. Songs like Jingle Bells, We Wish You A Merry Christmas, Deck the Halls, and Joy to the World were just a few of the Christmas tunes that were played in a melodic four part harmony. Sucher claimed that “It was a fun experience, definitely memorable!” Band director Mike Legvold also had some comments as he has played in the Tubachristmas for 15 years at multiple locations like St. Olaf and the Mall of America. Legvold stated that he loves “the low, deep and homogeneous sounds we get from having only tubas and euphoniums. It is also very enjoyable to get together with a large number of people who enjoy the same nerdy pastime”. The ages of players that executed the event had a whopping range from 9 to 86! Jake Norton was especially pleased to play in this unique band full of many different ages and stated that “the aspect I appreciated the most was that the complexity of concert band, with melody and harmony, still held out with just low brass.” Norton also liked that he “got to meet a huge variety of people via age and gender” who also played and shared a love for the low brass instrument like himself.